Mike Seeger - Store - 50 Years: Where Do You Come From? Where Do You Go? Two previously released CDs compiled from the Ramblers classic early Folkways recordings, plus a new compilation of Ramblers selections along with their field recordings of the traditional Southern musicians who inspired them, including Dock Boggs, Roscoe Holcomb, Tom Ashley, Maybelle Carter, and the Balfa Brothers. Each CD is accompanied by extensive notes. CD #1. The New Lost City Ramblers, 1958-1962: the Early Years. Mike Seeger, John Cohen, and Tom Paley. 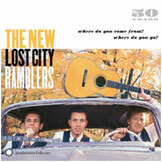 CD #3 The New Lost City Ramblers, Where Do You Come From? Where Do You Go?